Compost is a finely divided, loose material consisting of decomposed organic matter. It is primarily used as a plant nutrient and soil conditioner to stimulate crop growth. Although many people associate compost production with small garden compost piles that are tended with a shovel, most compost is produced in large municipal, industrial, or agricultural facilities using mechanized equipment. The expression "older than dirt" certainly applies to compost. Nature has been producing compost for millions of years as part of the cycle of life and death on Earth. The first human use of animal manure, a raw form of compost, was in about 3,000 B.C. in Egypt when it was spread directly on the fields as a fertilizer. Later, manure was mixed with dirty stable straw and other refuse and allowed to sit in piles until it was needed. Rain kept the piles wet and aided the decomposition process, producing a rich compost. The Greeks and Romans knew the value of compost to boost crop production and even used the warmth of decomposing compost to produce summer vegetables in winter. Christian monasteries kept the art of composting alive in Europe after the fall of the Roman Empire, and by about 1200 compost was again being used by many farmers. Shakespeare mentions it in several of his plays written in the early 1600s. In the United States, Presidents George Washington and Thomas Jefferson were prominent landowners during the late-1700s and early-1800s. When they were not involved with affairs of state, they both spent much of their time trying innovative farming practices, including experiments with various composting methods and materials. As years of successive crops depleted the nutrients in the soil on the East Coast, the practice of composting became widespread. This trend continued until the early 1900s when it was estimated that 90% of the fertilizer used in the United States came from compost. That all changed in 1913, when a German company began producing synthetic nitrogen compounds, including fertilizers. These new chemical fertilizers could be produced less expensively than messy animal manure compost, and the farmyard compost pile quickly became a thing of the past. By 1950, it was estimated that only 1% of the fertilizer used in the United States was derived from compost. One notable exception to this trend was the work started in 1942 by J.I. Rodale, a noted pioneer in the development of the organic method of farming. Rodale was one of the first to see the hazards of relying on synthetic fertilizers and the benefits of using compost derived from natural sources. Composting got a short-lived boost during the environmentally conscious era of the 1960s, but it wasn't until the 1980s when it became a big business. This surge wasn't the result of a renewed awareness of the positive aspects of compost, but rather a growing concern over the negative aspects of refuse. In short, in our efforts to get rid of our refuse, we were polluting our air, poisoning our rivers, and quite literally burying ourselves in it with our landfills. In order to divert some of the municipal refuse away from landfills, several cities established recycling centers in the early 1970s where people could bring cans, bottles, and newspaper rather than throw them in the trash. This was followed by curbside recycling, where people could place these recyclable materials in separate containers for pickup in front of their houses. Finally, many cities added additional curbside containers for yard wastes to be composted. By 1992, almost 1,500 cities had yard waste composting facilities. At the same time, tough new environmental laws mandated that industries could no longer simply dump their waste products onto the surrounding land or discharge them into nearby rivers. To meet these laws, many industries began their own recycling and composting programs. Environmental concerns also affected farmers, who were being blamed for the negative health effects that chemical fertilizers and pesticides had on humans and wildlife. As a result, many farmers decided to cut back or eliminate chemicals in favor of using compost. Today, most compost is processed in large facilities designed to handle a specific type of raw material. Agricultural compost is usually produced and used on the same farm that generated the raw materials. Industrial compost may be bagged and sold to individual buyers, or the raw materials may be sold in bulk to other composting facilities. Municipal yard waste compost is usually produced in facilities operated by the city or the refuse collection company and is sold to local landscaping companies and garden centers. Technically, compost may be made from any organic material. That is, it may be made from any part of an organism, plant or animal, that contains carbon. Compost also requires a source of nitrogen, oxygen, and water, plus small amounts of a variety of elements usually found in organic material, including phosphorus, copper, potassium, calcium, and others. In order for the organic materials to combine with the other materials and decompose into compost, several living organisms and microorganisms are needed. These include sowbugs, which help digest the materials and transport bacteria; earthworms, which aerate the materials with their tunnels; a variety of fungi, which help digest decay-resistant cellulose; mold-like bacteria called actinomycetes, which attack raw plant tissues; and many others. The most common raw materials used to make compost are yard wastes such as grass clippings, leaves, weeds, and small prunings from shrubs and trees. Most home garden compost piles and municipal compost facilities use yard wastes exclusively because of the large volume of materials available. Industrial compost facilities tend to use waste materials generated within a particular plant or region. For example, sugar beet pulp is mixed with other materials to make compost in an area where sugar refineries operate. Spent hops and grain from breweries also make excellent compost materials. Other materials include sawdust and wood chips from lumber mills, fish waste from canneries, and dried blood and pulverized animal bones from slaughterhouses. Agricultural compost facilities use materials readily available on nearby farms. These include animal manure, used stable straw, spoiled fruits and vegetables, field refuse, vineyard and orchard prunings, rotted hay, and other agricultural waste products. Some of the more unusual raw materials used to make compost include seaweed, chicken feathers, peanut shells, and hair clippings. The production of compost is both a mechanical and a biological process. The raw materials must first be separated, collected, and shredded by mechanical means before the biological decomposition process can begin. In some cases, the decomposition process itself is aided by mechanical agitation or aeration of the materials. After decomposition, the finished compost is mechanically screened and bagged for distribution. There are several methods for producing compost on a large scale. The methane digester method places the raw materials in a large, sealed container to exclude oxygen. The resulting oxygen-starved decomposition not only produces compost, but also methane gas, which can be used for cooking or heating. The aerated pile method places the raw materials in piles or trenches containing perforated pipes that circulate air. The resulting oxygen-rich decomposition produces a great amount of heat, which kills most harmful bacteria. The windrow method places the raw materials in long piles, called windrows, where they are allowed to decompose naturally over a period of several weeks or months. It is the least expensive method of all. 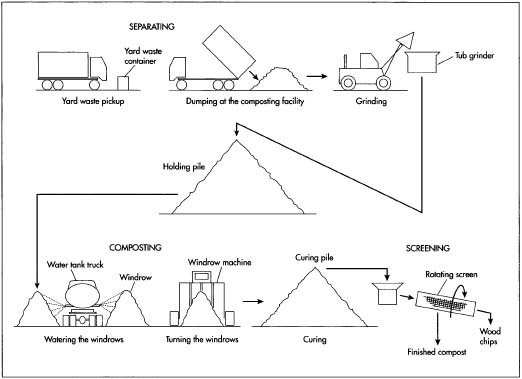 Here is a typical sequence of operations used to convert municipal yard wastes into compost using the windrow method. 1 Yard wastes are deposited in separate containers by homeowners, and the containers are placed at the curb for pickup on the regular refuse collection day. Homeowners are instructed that only certain yard wastes are acceptable for collection. These include grass clippings, leaves, weeds, and small prunings from shrubs and trees. Short pieces of tree limbs up to about 6 in (15 cm) in diameter are also acceptable. Homeowners are also instructed that certain other yard wastes are not acceptable. These include rocks, sod, animal excrement, and excessive amounts of dirt. Palm fronds are prohibited because the frond spikes do not decompose and carry a poison. Food scraps, fruits, and vegetables are also prohibited because they can attract rodents, carry unwanted seeds, and contribute to odors. 2 The yard wastes are collected by separate refuse trucks and are transported to the processing center where they are dumped in piles. The piles are visually inspected, and any oversized or unacceptable materials are manually removed. 3 A large, wheeled machine called a front loader picks up material from the piles and dumps it into a tub grinder. The tub grinder has a stationary vertical cylindrical outer shell with a rotating cylindrical inner shell. As the material passes between the two shells, it is ground into smaller pieces and thoroughly mixed. The ground material falls out the bottom and through a screen where the larger pieces are screened out. The remaining material is transported by a conveyor belt to a holding pile. 4 The larger pieces are sold to landscaping companies for use as mulch or ground-cover without further processing. The rest is loaded into large dump trucks and transported to the composting area where it is dumped in long rows, called windrows. Each row is about 6-10 ft (2-3 m) high and several hundred feet (m) long with a triangular cross section. A flat space about 10 ft (3 m) wide is left between each row to allow vehicles to move along the length. 5 The composting area may cover several acres (hectares). After a windrow is laid in place, the material is dampened by a tank truck that moves along the row spraying water. The water aids in the composting process and helps minimize wind-blown dust. 6 Every few weeks, a special machine straddles each windrow and moves along its length to turn and agitate the material. This breaks down the material into even smaller pieces and exposes it to oxygen, which aids in the decomposition process. After the windrow is turned, it is sprayed with water again. This process continues for two or three months. In hot, dry weather, the windrows may have to be watered more often. During decomposition, the internal temperature of the pile may reach 130° F (54° C), which helps kill many of the weed seeds that might be present. 7 The raw compost is scooped up with a front loader and moved to a large conical pile where it is allowed to finish the decomposition process over a period of several weeks. This process is called curing and it allows the carbon and nitrogen in the compost to adjust to their final levels. Diogram depicting the commercial processing of yard waste into compost. the screen are about 0.5 in (1 cm) in diameter. The compost is fed into the raised end of the rotating screen from the hopper by a conveyor belt. As the compost tumbles its way down the length of the rotating screen, the smaller material falls through the screen and is moved to a storage pile by a conveyor belt. The larger material that cannot pass through the screen falls out the lower end of the cylinder and is either returned to the compost piles for further decomposition or is sold as wood chips. 9 Much of the finished compost is loaded into large dump trucks and sold in bulk to landscaping companies, municipalities, nurseries, and other commercial customers. Some of it is sealed in 40 lb (18 kg) plastic bags for retail sale to homeowners. Using the windrow method, a typical suburban yard waste processing facility can produce as much as 100,000 tons (91,000 metric tons) of compost a year. Composting companies regularly have their finished compost tested to ensure it is free of harmful materials and contains the proper amounts of plant nutrients. The tests measure the size of the particles, moisture level, mineral content, carbon-to-nitrogen ratio, acidity, nutrient content, weed seed germination rate, and many other factors. For example, waste particles should be between 0.5-2 in (1.2-5 cm) in diameter in order to encourage the flow of oxygen within the compost. Likewise, the level of moisture should be above 40% to facilitate the compost process. Moisture levels that dip below 40% slow the process and present the risk of spontaneous combustion. Also, the ideal ratio of carbon to nitrogen should average 30 parts carbon to one part nitrogen by weight. The ideal balance maintains a healthy microbial population that speeds decomposition and minimizes odor. Compost made from yard wastes, such as leaves and grass clippings, rarely contains any harmful materials. Problems can occur, however, when compost is made from partially sorted municipal refuse, certain industrial wastes, or sewage sludge. In those cases, unacceptable levels of toxic metals, chemicals, or harmful bacteria may be present. To protect the public, the federal Environmental Protection Agency (EPA) sets acceptable levels for thousands of materials that might be present in compost. Each state may have its own standards as well. For municipal refuse, source separation—that is, having homeowners sort their yard wastes into separate containers rather than throw them away with the rest of their trash—is felt to be one of the most effective way to produce clean, safe compost. Eventually composting may also provide a means for handling and neutralizing even the harmful materials. For example, at several older military ammunition factories and storage facilities the surrounding soil is contaminated with the explosive material trinitrotoluene, also known as TNT. Researchers are using a specially formulated compost mix of vegetable wastes and buffalo manure to neutralize the soil through a simple biological composting process that converts the explosive organic components of TNT into less harmful compounds. Christopher, Tom and Marty Asher. Compost This Book! Sierra Club Books, 1994. Hansen, Beth, editor. Easy Compost. Brooklyn Botanic Gardens, Inc., 1997. Martin, Deborah L. and Grace Gershuny, ed. The Rodale Book of Composting. Rodale Press, Inc., 1992. Raloff, Janet. "Cleaning Up Compost: Municipal waste managers see hot prospects in rot" Science News (January 23, 1993): 56-58. The Compost Resource Page. http://www.oldgrowth.org/compost/ (June 7, 1999). Composting Council. May 1999. http://www.compostingcouncil.org/ (June 7,1999).